The Country Club of Landfall is hosting their Annual July 3rd Independence Day celebrations! Dinner starts at 6:00pm and the menu is perfect for the holiday! The buffet includes roasted chicken, barbecued salmon, pulled pork, corn on the cob, potato salad, corn bread, and roasted potatoes. Additionally, there is a kid’s buffet that offers chicken tenders and mac n cheese. From 7:00 until 9:00 there will be music, drinks, and kids games at the Nicklaus Clubhouse. The firework show starts at dusk so be sure to bring your lawn chair or blanket! We’re only one week away from July 4th! Come celebrate the holiday in Downtown Wilmington. There are festivities from 6:00pm until 9:30pm. The fun begins with live music. A local favorite, Port City Shakedown will be performing along the Cape Fear River. Grab dinner at one of the numerous food vendors that will be located on Water St and Riverfront Park. The highlight of the night is the spectacular fireworks show! The fireworks will be launched from a barge in the Cape Fear River at 9:05pm. The best view for the fireworks show will be along Front Street. For more information on the event visit their website http://www.wilmingtonnc.gov/departments/parks-recreation/events-permits/4th-of-july. Landfall is the Best of the Best for Intracoastal Views! Landfall was just named as best of the best for Intracoastal Waterway views by ideal-LIVING Magazine! Wilmington, NC — A jewel of North Carolina’s majestic coastline, set on 2,200 acres along the Intracoastal Waterway and minutes from Wrightsville Beach and historic downtown Wilmington, Landfall is truly an exceptional place to call home. With 2.5 miles of property on the Intracoastal and another 2 miles overlooking neighboring creeks and marsh, Landfall is coastal living at its finest. At the heart of the gated community is the Country Club of Landfall, a member-owned equity club offering 45 outstanding holes of golf – 27 by Jack Nicklaus, and 18 by Pete Dye as well as 14 tennis courts with a variety of surfaces, two clubhouses with varied dining options, fitness center and Olympic-sized pool. This summer enjoy a show at one of the oldest Theaters in the United States. Thalian Hall, which has been open since 1858, is a major asset to the local economy. Built when Wilmington was the largest city in North Carolina the theater has seen a lot of changes. During the Civil War it was constantly used as a place of amusement, later notable actors such as Buffalo Bill Cody and Sir Henry Lauder performed there. Even though there have been repairs due to a small fire and renovations the theater has remained the mostly unchanged in an attempt to preserve the historical integrity of the building. Over the next few months there will be a multitude of shows at Thalian Hall. Currently playing is the popular musical Jesus Christ Superstar followed by the classic Bye Bye Birdie next week. Additional shows include Norman, Camelot, How to Eat Like a Child, Paris Can Wait, and South Pacific. This summer make some time to enjoy a show and experience the rich history of Thalian Hall! For more information on the upcoming shows visit their website http://www.thalianhall.org/events. The third concert of the Airlie Gardens’ Summer Concert Series is taking place tomorrow night! The concert series is an outdoor event open to the public held at the beautiful Airlie Gardens. Airlie Gardens is 67 acres of gorgeous flowers, scenic walking paths, a freshwater lake, and formal gardens along the Intracoastal Waterway. The band performing is Jack Jack 180, a pop, rock, alternative group. There are a total of nine performances throughout the summer, which are on the first and third Friday of every month from 6:00pm until 8:00pm. Additional bands that will be playing are The Wilmington Big Band, Signal Fire, The Midatlantic Band, and Jim Quick & Coastline. The concert series has something for everyone with music genres ranging from patriotic and big band to beach music and reggae. 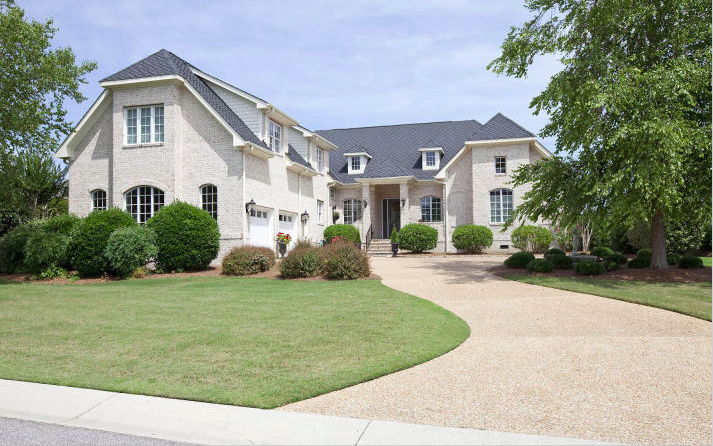 This custom brick home is situated along the 7th fairway of the Jack Nicklaus Course in the Landfall community. The light filled floor plan is both elegant and comfortable with three bedrooms and five bathrooms. The gourmet kitchen features custom cabinets, a gas cooktop, and center island all open to a relaxing family room with built-ins and a fireplace. The great room features a tray ceiling, wet bar, fireplace, and opens to a covered tile terrace, perfect for entertaining and al fresco dining. The lower patio offers additional seating areas. Private and peaceful, the master suite with high ceilings, dual closets and vanities, provides ample space to unwind. Two additional bedrooms, each with private baths, are on the first floor. 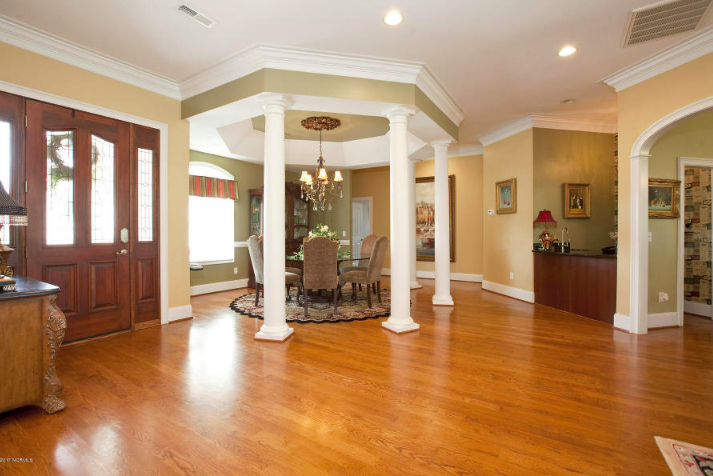 The large bonus room has a must see theatre and hobby room. The Riverfront Farmers’ Market is now open in Downtown Wilmington. Open on Saturdays from 8:00am until 11:00am, the Farmers Market is a great place to start your weekend. An array of fresh food is available, some of which are fruit and berries, vegetables, plants, herbs, flowers, baked goods, jams, wine, meats, seafood, honey, eggs, and cheeses. Located along Water and Princess Streets the market is right in the heart of the Historic Wilmington. There are gorgeous old houses, cobblestone streets, and tours to explain the history of Wilmington. 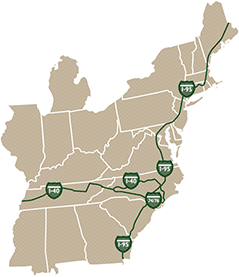 Additionally, there is the scenic Cape Fear River with boardwalk running along side it, making for a stunning walk. Next Saturday visit the Riverfront Farmers’ Market and see all that Downtown Wilmington has to offer! 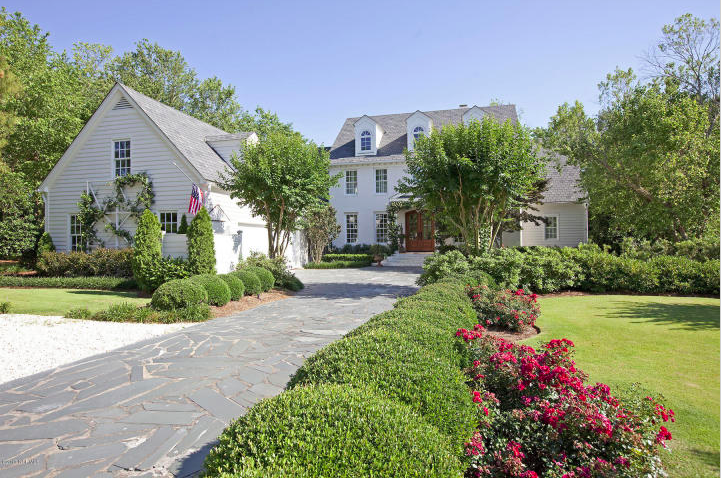 A beautifully appointed brick home on a quiet cul-de-sac in Landfall. The lovely slate driveway leads to detached garage with extensive storage above. This charming home is spacious with five bedrooms and four and half bathrooms. The newly renovated kitchen is state of the art and includes an AGA oven, 6 burner gas cooktop, large island, a copper farm sink and copper back splash behind the stove. Extensive built-ins throughout the house are a perfect way to stay organized. Additional upgrades include, two new hot water heaters, new Grand Manor asphalt shingle roof in 2015, second floor HVAC replaced in 2011 and third floor HVAC replaced in 2016. 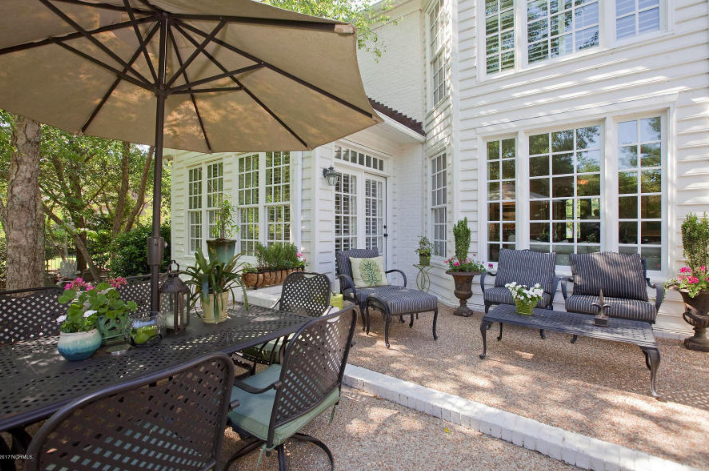 There is plenty of room to enjoy the gorgeous North Carolina weather with the screened in porch and expansive back patio, which is perfect for cookouts!